Sparsholt is a village to the north-west of Winchester, Hampshire [Grid Ref: SU435312]. Visitors are always most welcome to join us or to listen. Sunday ringing is weekly from 9.30am to 10am, and our practice night is on Monday from 7.30pm to 9.00pm. Parking is usually available in the Village Hall car park opposite the church. We are a six bell tower [tenor 8cwt], and the ringing chamber is on the ground floor. St. Stephen’s church is built on a site that dominates the village, and one that has almost certainly been a centre of worship since Saxon times. 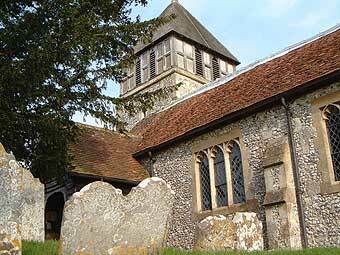 The earliest building was probably a wooden structure succeeded by a simple stone and chalk building of nave and chancel in the 12th century. 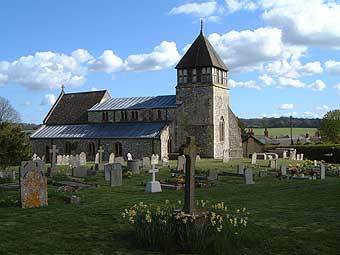 The church was enlarged in the 13th century, and the chancel rebuilt in the 14th century, at which time the tower was added. The flint and stone building took its present form late in the 19th century when the medieval church was comprehensively repaired and extended. During the restoration portions of several medieval wall paintings came to light, including a fine though mutilated fresco of St, Stephen. Unfortunately the colours faded on exposure to the light and the fresco could not be preserved. Outside an ancient mass dial can be seen in the south wall towards the chancel. The churchyard itself is of interest as a site of an ancient meadow untouched by cultivation or fertilisers. In the summer it produces a wealth of flowers and a range of mosses and lichens. Taken from “St. Stephen’s Sparsholt, A brief history and guide” by Elizabeth May, with kind permission. St Stephen’s church Sparsholt is part of The Downs Benefice which includes St Mary’s Crawley, St Mary’s Chilbolton, St Catherine’s Littleton and St Peter and Holy Cross Wherwell. This entry was posted in Uncategorized on May 24, 2015 by jennywatson0831.